ABB LOVOS-5 and LOVOS-10 low voltage surge arresters ensure protection of low voltage overhead lines, distribution transformers and LV electrical equipment from effects of lightning and switching overvoltage. 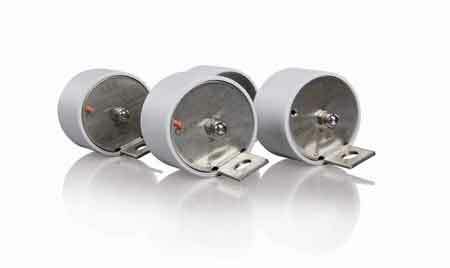 ABB LOVOS surge arresters are suitable for indoor and outdoor installations. ABB LOVOS low voltage surge arresters are a new generation of low voltage surge arresters. Designed in close cooperation with clients from all around the whole world, taking into account all needs and requirements of the market. The LOVOS surge arresters have a frequency range from 48 to 62 Hz and can be used for indoor and outdoor applications. The nominal discharge current is 5 kA or 10 kA and the continuous operating voltage, Uc=280 V, 440 V, 500 V or 660 V.
The principal "active" element of the surge arrester is a metal oxide varistor characterised by high non-linearity. At a working voltage mainly a capacity current flows smaller than 1 mA. Any voltage increase causes a large increase of current flowing throught the varistor, leading in turn to immediate limitation of further voltage increase on surge arrester terminals.When the overvoltage disappears, the surge arrester immediately returns to its basic state. Surge arresters are equipped with a disconnecting device, that disconnects the surge arrester from the network if it becomes damaged as the result of overvoltage of too high energy or inadmissable voltage increase in the system. If such a situation occurs then the bottom terminal of the disconnecting device is "rejected" by the spring inside. This terminal remains suspended on an insulation "Leash".